The WorldCast Manager is a unique software solution centralizing and unifying the monitoring and management of all connected devices across one or multiple sites. 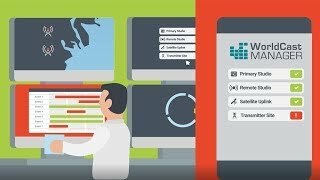 It offers a unique combination of modules to oversee the entire ecosystem and comes with a built-in ticket & incident tracking platform tied to a powerful analytics & reporting engine. 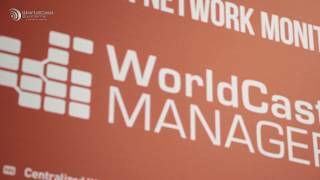 Leveraging its advanced auto-pilot configuration engine, the WorldCast Manager is the fastest network monitoring solution to deploy. Following the automated scan, the WorldCast Manager identifies and starts monitoring all your devices within minutes if not seconds. The WorldCast Manager has been designed with scalability in mind, enabling easy deployment regardless of the size and complexity of your network or needs. Can’t find the driver you need in our existing library? Send us your MIB files and let us build the driver for you! The driver creation service is complimentary with any valid support contract! WHAT ABOUT DEVICES WITHOUT SNMP? SNMP-enabled devices can be seamlessly integrated into the WorldCast Manager software but what about devices without SNMP compatibility? The AUDEMAT CONTROL Silver, manufactured by our sister-company WorldCast Systems, can act as a local hub to interface with one or several legacy products within the network. It enables connections based on more traditional methods such as digital, analog or audio inputs, relays and serial transfer. New WorldCast Manager versions are available every quarter and accessible for download to customers with valid support contracts.